Continuing on foot through Arles, we explored the old town of Vieille Ville, a maze of high shuttered houses looming over narrow cobbled streets, stone stairways and tiny squares. On the way, we stopped at the house where physician, author and astrological consultant, Nostradamus lived in 1547. Besides his other well-known predications, Nostradamus is famous to have predicated the 21st century clash between Judeo-Christian and Islamic civilizations. During his time in Arles, Nostradamus assisted the prominent physician Louis Serre in his fight against a major plague outbreak in the city. Turning a corner into the Place due Forum, we came upon a very familiar Van Gogh scene, The Cafe Terrace (now named Café Van Gogh) where he painted the Café Terrace at Night in September 1888. 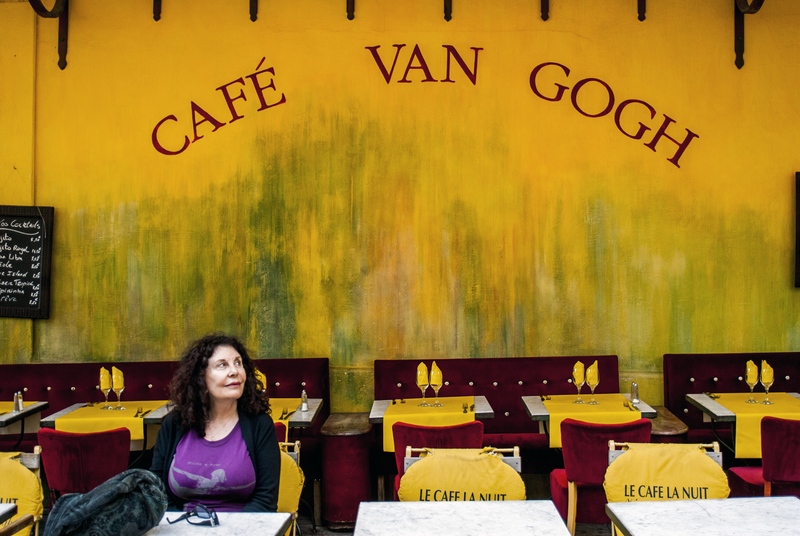 Visitors of the restaurant can still sit at the table where Van Gogh set up his easel looking south towards the artificially lit terrace of the popular coffee house, and into the darkness of the rue du Palais. This is the very first painting in which he used starry backgrounds; he then went on to paint star-filled skies in the iconic, The Starry Night a year later. 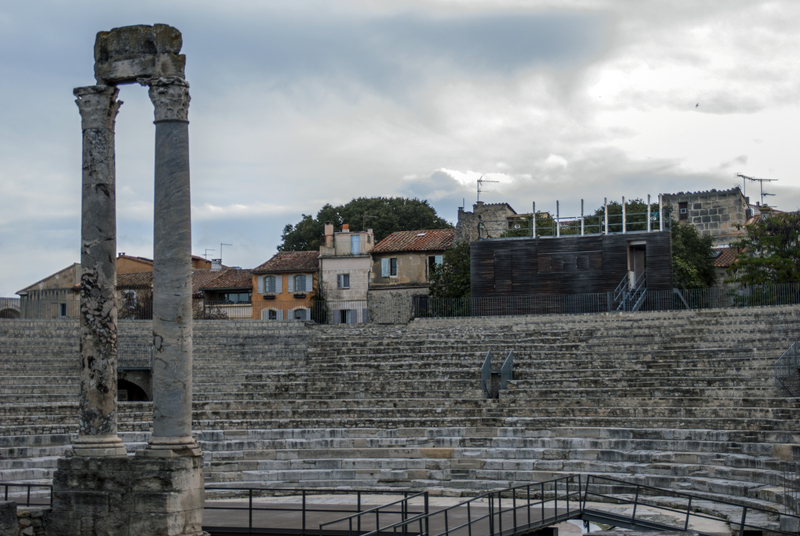 We returned to the bus and continued traveling twenty-miles outside of Marseille to Saint-Rémy-de-Provence, where we visited the ruins of the ancient Roman city of Glanum. The city was founded in the 6th century BC by a Celto-Ligurian people called the Salyens. Glanum is known for two well-preserved Roman monuments of the 1st century B.C. – a mausoleum and a triumphal arch. The Mausoleum of the Julii dates to about 40 BC, and is one of the best-preserved mausoleums of the Roman era. Next to the mausoleum is The Triumphal Arch, a visible symbol of Roman power and authority. It was built near the end of the reign of Augustus Caesar (who died in 14 AD). From Glanum, we continued on foot to the Saint-Paul Asylum, where on May 8th, 1889, Van Gogh voluntarily admitted himself (he suffered from various types of epilepsy, psychotic attacks, and delusions – even cutting off his ear as a gift to a prostitute). During much of his stay there, he was confined to the asylum, painting the world he saw from his barred window (in his paintings though, he painted the scenes without the bars). In his room, we saw an uncomfortable looking wire bed, a water pitcher and basin, and a wooden chair. I felt the claustrophobia that Van Gogh must have felt as he slept in this little cage of a room. In the communal bathroom, there was an old porcelain tub, with a wooden collar to place around the patient’s neck, in order to hold them imprisoned in the icy water – which Doctor’s believed was a cure for mental illness. When Van Gogh was permitted to venture outside of the asylum walls, he painted the wheat fields, olive groves, and cypress trees of the surrounding countryside, which he saw as characteristic of Provence. Over the course of the year, he painted over 150 canvases. One of his more recognizable works of this period is the Irises. It was painted before his first attack at the asylum, possibly due to a form of epilepsy he suffered from. He called the painting, “the lightning conductor for my illness,” because he felt that he could keep himself from going insane by continuing to paint. His works of the asylum’s interior convey the isolation and profound sadness that he must have felt. As I stood in the Asylum garden, tears came to my eyes… I felt a strange peace come over me – possibly and hopefully what Van Gogh might have felt as he painted this beautiful and iconic scene before me. While Van Gogh’s time at Saint-Rémy forced management of his vices, such as coffee, alcohol, poor eating habits and periodic attempts to consume turpentine and paint – his stay was not pleasant. The food was poor. His only apparent form of treatment were two-hour ice baths twice a week. By early 1890, Van Gogh’s attacks of illness worsened and he believed that his stay at the asylum was not helping to make him better. This led to his plans to move to Auvers-sur-Oise, just north of Paris in May, 1890. It is so ironic that Van Gogh only sold one painting during his lifetime, Red Vineyard at Arles (and that to a friend). This painting now resides at the Pushkin Museum in Moscow. The rest of Van Gogh’s more than 900 paintings were not sold or made famous until after his suicide in 1890 by gunshot (he was 37). Vincent van Gogh is buried next to his beloved brother Theo at the cemetery in Auvers-sur-Oise. Terrific post. I must see it all.